Daniel Romanchuk won by three minutes. 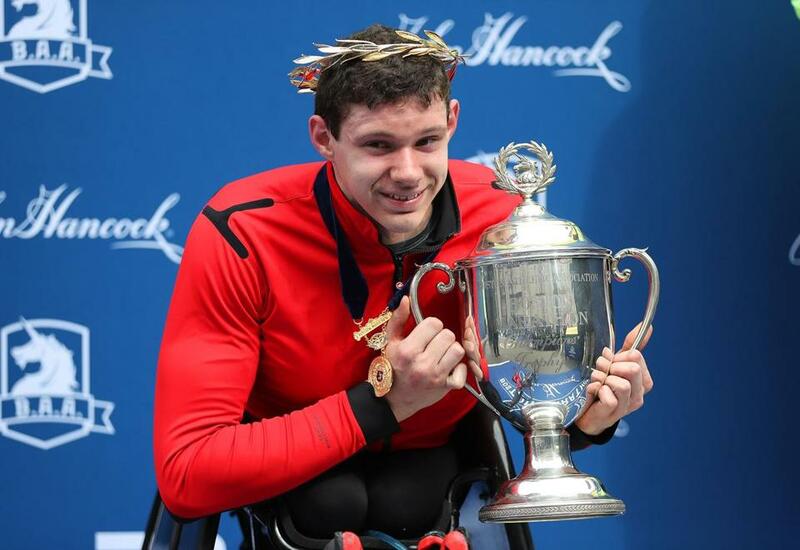 Daniel Romanchuk and Manuela Schar posted runaway victories in the Boston Marathon’s push-rim wheelchair division Monday, as the 20-year-old Romanchuk became the youngest men’s winner here while Switzerland’s Schar won her second women’s title in three years by more than seven minutes over five-time titlist Tatyana McFadden. “This has been an amazing series,” said Romanchuk, who won the Chicago and New York races last year after finishing third in Boston. Romanchuk, who defeated Swiss four-time defending champion Marcel Hug, South African 10-time titlist Ernst van Dyk, and Japanese two-time champion Masazumi Soejima, bided his time on the slick early downhills and made his decisive move in the Newton hills. “I have grown up watching them on the world stage,” said Romanchuk, who beat Soejima by nearly three minutes in 1 hour, 21 minutes, and 36 seconds to become the first American winner of the men’s division since Jim Knaub claimed his third straight title in 1993. Manuela Schaer won Boston for the second time. Schar, who has won all five World Marathon Majors since Berlin last fall, destroyed the women’s field, leading by 24 seconds after 3 miles. Her time of 1:34:19 would have placed her in the top half of the male finishers, a number of whom she passed along the course. Forty years after blazing through the field to win in an American-record 2:35:15, Samuelson set a goal to finish within 40 minutes of that time. The 61-year-old Maine native achieved her goal, finishing in 3:04:00, with 10 minutes to spare. The winner of the first-ever women’s Olympic marathon at the 1984 Los Angeles Games, Samuelson started her collegiate career at Bowdoin before transferring to North Carolina State, where she became an All-American. The retired US Army Master Sergeant, who lost both legs and part of his right arm and hand when injured by an improvised explosive device in Afghanistan in 2012, spent time with the Sox in February during spring training and was a guest of Tony La Russa at Sunday’s game. He drew on the struggling Sox as motivation as he made his way from Hopkinton to Boston. 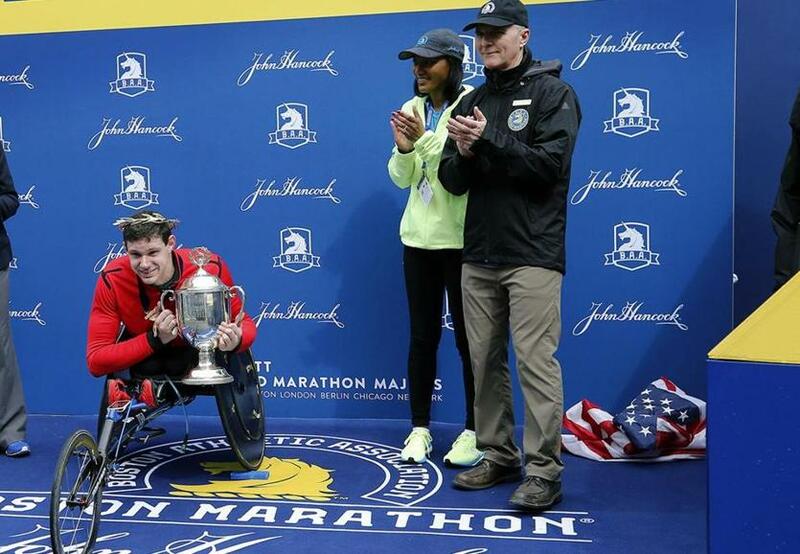 Although he earned his first three Boston medals running on prosthetics (“It destroys you physically,” he said) and his fourth via push-rim wheelchair, he wanted a new challenge this year. But he underestimated the challenge he faced, assuming the running training he did for a 10-miler last weekend would suffice. “I’ve got to be honest with you — I disrespected the handcycle so bad,” said King, who finished in 2:18:14. He said at one point he was passed by a fellow handcycle athlete who was pedaling with one hand and stuck a whistle in his mouth and waved to get the crowd pumped up with the other hand. He thought about the Sox for the entire race. Seven months after he lost his legs, King got his running prosthetics. He started learning to run on them the day of the marathon bombings in 2013. Watching news coverage of the tragedy on television, King decided he would somehow, someway run in the race the following year. Daniel Romanchuk had been celebrating with the American flag, seen at right, prior to posing with his trophy for winning the men's handcycle division. Jack Fleming, chief operating officer of the Boston Athletic Association, issued an apology after the American flag was seen in a heap on the ground during the wreath and trophy ceremony for Romanchuk.